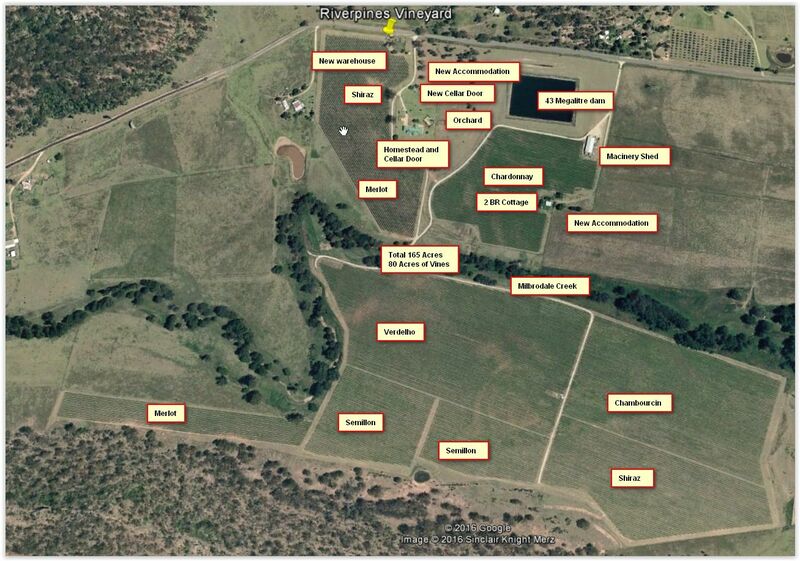 Riverpines Vineyard is the largest organic vineyard in all of the Hunter Valley, and with 80 acres of grapes situated in an overall 165 acres of the property, the vineyard is the largest overall in the Broke Fordwich region of the Hunter. The vineyard was planted in 1999 and 2000, and the vines are entering their most productive years of yield and taste. Ascella Organic Wine was launched with the 2009 vintage, and has won many awards in its short history, including five international medals. Ascella has an active cellar door, successful Friends and Partners memberships, is sold online, and to specialty bottle shops and restaurants, as well as exports to Europe, Asia and Canada. A beautifully finished 5 bedroom 2 bathroom homestead with swimming pool. Stunning views overlooking the vineyard and down the Broke Fordwich Valley. All located three km to primary school, 25 km to major shopping and services centres. Water is one of the best design features of this property. The homestead has a 30,000 litre concrete rainwater storage tank and filtered water. The vineyard has double frontage to the Milbrodale Creek, a 43 megalitre lined dam, 50 megalitre per year bore and 80 megalitre PID license for water piped from the Hunter River. All complemented by a computerized drip irrigation, driven by a large programmable hydra‐drive pump for the vineyard. A two bedroom cottage rental property, renovated in 2016 provides short term accommodation as well as Hunter Vineyard Stay offered in the homestead. The property is zoned RU4 for multiple recreational accommodation units with conceptual designs in place for the Hunter Eco Resort. This is a unique and exclusive ecotourism opportunity situated in a tranquil (dead-end valley), surrounded by National Parks and heritage walks. It has the capability of offering a unique experience in a relaxing, chemical free environment with abundant wildlife, all adjacent to Ascella organic wines and vineyard. The resort would be situated overlooking the orchard, facing down the valley with views 10 km to Broke and further. The current cellar door (part of the homestead) would be relocated within the new development, which will have a new cellar door/event centre. The Hunter Valley is a popular destination of choice for weddings, events and conferences, many venues being booked years in advance. As the oldest wine region of Australia, the Hunter Region is nominated as one of the 10 best wine areas in the world to visit by the largest wine magazines in the world. This property offers you all the advantages of the Hunter Valley wine growing and tourism region with all the benefits for health and well-being in the isolated valley of the Broke Fordwich area. Because the location is away from other vineyards and agriculture, the purity of the wine can be protected. Situated on the Milbrodale Creek, Riverpines Vineyard is a premier Hunter Valley Organic Vineyard within easy access to the city of Singleton and to Newcastle and the Central Coast beaches. Please submit the inquiry form for this property to receive our Mini Prospectus and to Express your Interest in one or all of these Options for your consideration or call our Special Agent any time.